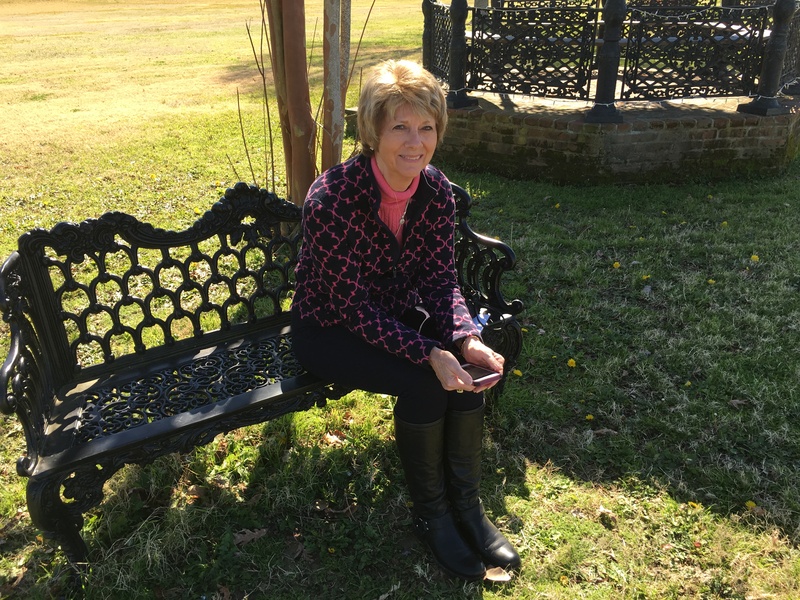 Natchez MS – Let's Go RVing! Three Town Houses and Two Cemeteries in One Day! Three town houses and two cemeteries in one day! 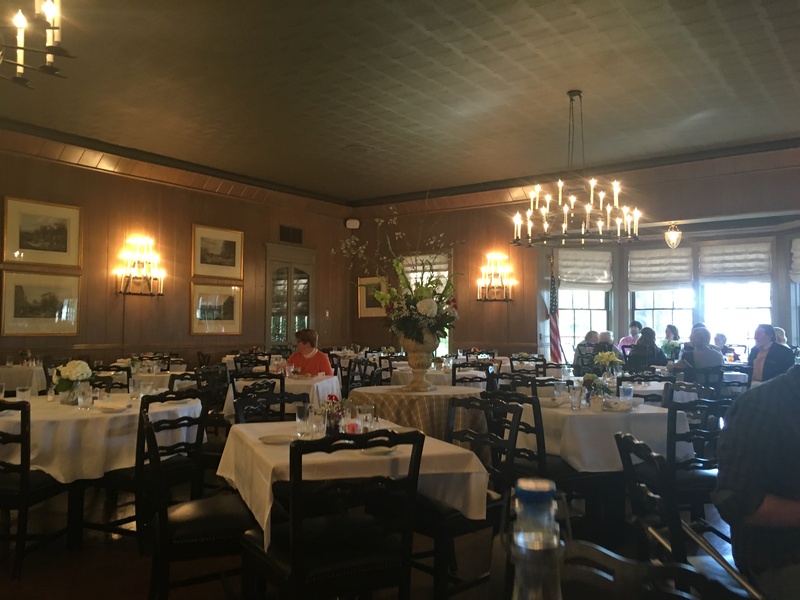 We started off at Stanton Hall timing it so we could get the tour and then have lunch at the adjoining Carriage House. It definitely was a good decision. Stanton Hall is absolutely breathtaking both inside and out. 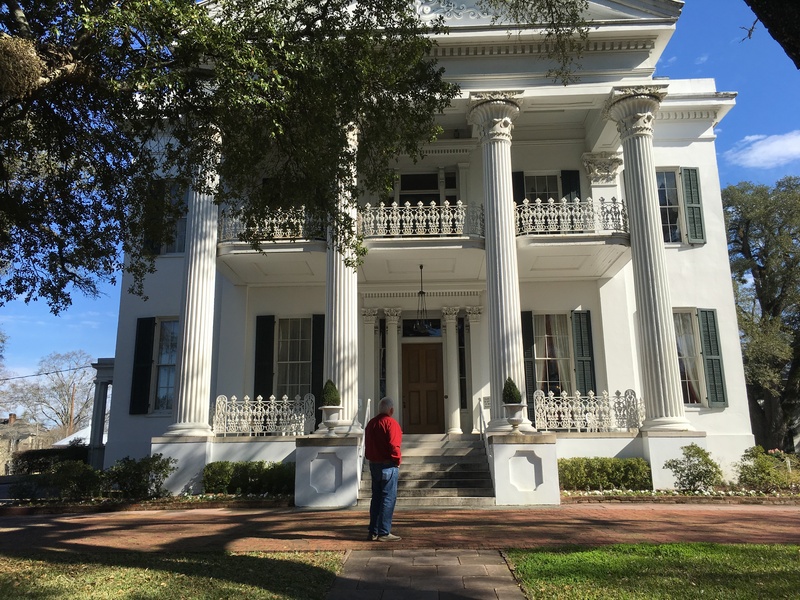 The outside, as many of the town houses in Natchez are, is palatial to say the least and the inside is absolute overkill. The house was built in 1857 by Irish immigrant and cotton merchant Frederick Stanton. It is believed that Mr. Stanton’s father sent him and his brother to America in an effort to begin cotton farming here in order to circumvent the taxes that he had to pay on the cotton he used in his business in Ireland. Mr. Stanton married a young girl from Kentucky who was from a fairly wealthy family. Perhaps that it why Stanton Hall is absolutely over the top in many ways. The front door measures ten feet by four feet and is the perfect entrance into such an extravagant home. The Greek Revival style residence in the heart of Natchez has a foyer that could easily hold a two bedroom starter home. Enormous mirrors hang in the end rooms, one re-silvered, one not and they are set up so when standing in the middle of the room you can look in one mirror and see a cascade of mirrors behind you. Mr. Stanton had hired an Irish architect and though the house is breathtakingly beautiful it is not livable. The bedrooms are located upstairs and imagine how high the stairs have to go if the ceilings on the first floor are 17 feet high! Unfortunately Mr. Stanton only lived in the completed home a few months before he died. The home was then sold and became Stanton College for Young Ladies. The bottom floor was used as classrooms and the bedrooms upstairs were large enough to house several girls. Eventually the home was purchased by the Pilgrimage Garden Club and they worked for several years to restore it to its original splendor. In 1974 it was designated as a National Historic Landmark. After our tour we walked over to the Carriage House for lunch. It is definitely a place reminiscent of the old South. As soon as we sat down they brought us a plate of biscuits and a serving of grape jelly! I had a delicious salad with greens, bacon, eggs, grilled chicken, blue cheese and a yummy dressing. Unfortunately for my waist line we requested more biscuits to go along with it. Jerry had a Bingo Burger with pimento cheese, bacon and hickory sauce along with French fries. He said the burger was terrific. We both agreed that it was one of the best meals we have eaten since we’ve been gone but I do attribute part of that to it being just plain ole food like we’re used to! We were then heading for Longwood House but saw a sign for the City Cemetery and since that was one of the places I had on today’s agenda we changed our itinerary. We missed the turn-in and ended up at the National Cemetery. It is located on the Bluff and one side looks over the Mississippi River. We rode through both sides and it was just overwhelming. Many graves were marked with World War II, Viet Nam, Korea and sadly enough Unknown. It is very humbling to realize the number of people who have lost their lives defending our country and our freedom. Wonder what they would think of what we have done to our country now. We saw graves marked with “wife of”, “daughter of”, and we were not quite sure who was eligible to be buried there so when we got back to the coach I looked it up. According to the National Natchez Cemetery website it is open to “all members of the armed forces who have met a minimum active duty service requirement and were discharged under conditions other than dishonorable. A Veteran’s spouse, widow or widower, minor dependent children…” are also eligible. Our next stop was the winding road of the City Cemetery. Some of the monuments honoring the dead were very large, some crumbling with age. We looked at the dates and saw many deaths occurring in the 1800’s. Our next stop was the Longwood House, to me a rather sad house. Looking at it upon arrival one can hardly comprehend the majesty of the house. It is a six stories high octagonal home and is the largest octagonal house in the United States. Having seen the outside of other houses of irregular shape I always wondered how the inside was but when inside this house I never felt that it was an octagon. Only the bottom floor, the basement, is completed. Howard Nutt bought the property complete with a house, cemetery and carriage house. When he decided to build Longwood he moved his family out and work began on the grand house. Unfortunately 18 months after the work began the Civil War began and the workers dropped their tools right where they were and went off to war thus the only completed floor was the basement. Mr. Nutt moved his family back into the basement but he died shortly thereafter. Mrs. Nutt continued to live there after the war but in very reduced circumstances. Of the thirty-two rooms planned for the house, only the nine rooms on the basement floor were completed. 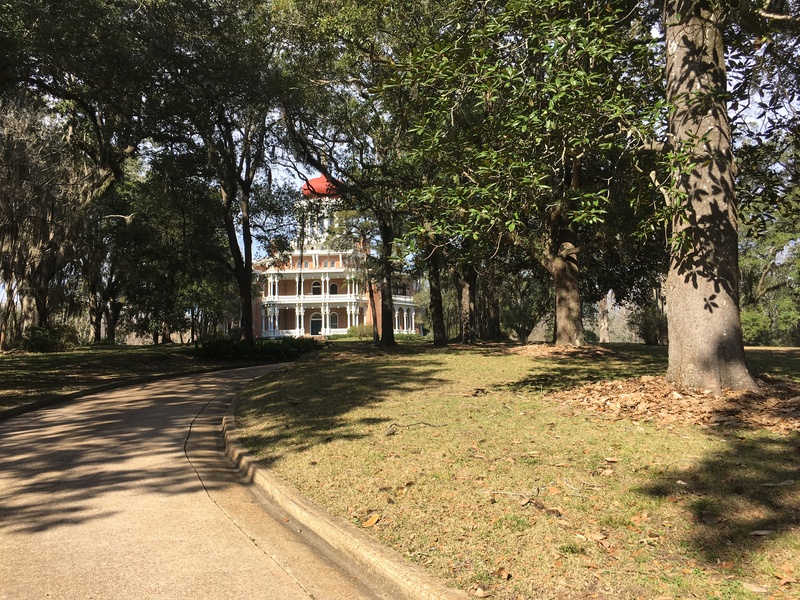 It is now owned by the Pilgrimage Garden Club of Natchez and is a Registered National Historic Landmark thus Nutt’s Folly will never be completed. Punkah or Shoo Fly – not very clear but you get the idea. 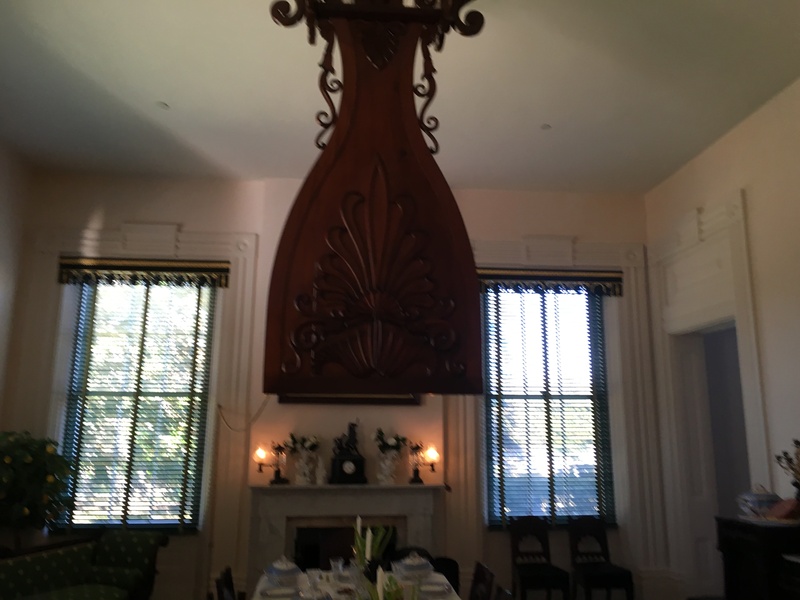 punkah or shoo fly over the dining room table. The punkah is said to the largest in the South. The upstairs is very different from the downstairs. Whereas the downstairs was used for entertaining and “living” the upstairs was very utilitarian with a central hallway and bedrooms and a bath emanating off of it. Visiting town houses has been very different from visiting the plantations in Louisiana. 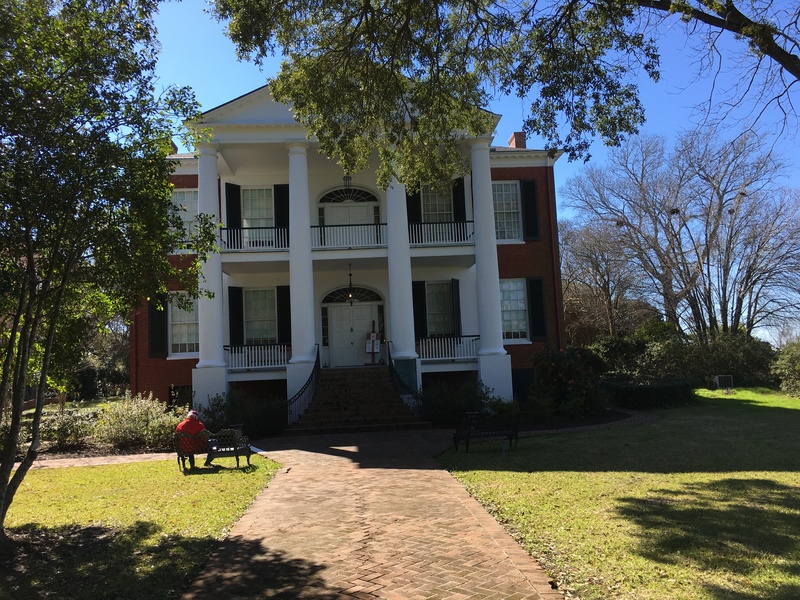 Although the owners of the town houses owned plantations outside of Natchez, many in Louisiana, they lived in the town houses and they are all right there in the city. We had to ride long distances to see plantations and could only see one or two during a day but in Natchez we could really see a lot in a day. That’s how we saw three town homes and two cemeteries and still got back to the coach in time to cook dinner Natchez appears to be a great town full of Southern hospitality and a town I’d love to visit again. It reminds me of Memphis with its small town feel and gentility. Boy we made a day of it today! We left about 10:00 headed for the Natchez Visitors Center. I had heard that it was one of the best visitor’s centers and it certainly is nice. We got a lot of information about Natchez and bought tickets to see three of the plantations. We may see more on our own. We discussed the Natchez Trace and were assured that we could go in our motor home towing the car as we were thinking of taking that route home. I questioned that so they said they would check on it for us. We then watched a 15 minute video on Natchez and it was quite informative. I would suggest that anyone visiting Natchez make the Visitor’s Center your first stop. And —- everything in the gift shop was 25% off! Of course I bought a magnet and also a t-shirt. We were told that if we were walking people we could walk to the several places we had planned to go to so we took off. If we were not walking people when we left we certainly were by the time we returned after 6:00! We walked down to Rosalie Planation only to realize that the tours started on the hour and we had missed the 12:00 by 10 minutes. I bought a magnet in the gift shop and then we sat out in the lovely yard right on the Mississippi and just took in the beautiful view. The tour started at 1:00 and Jerry and I were the only ones on it. Purchased by the Mississippi State Society Daughters of the American Revolution it has been kept in pristine condition. Many of the pieces of furniture are original to the house and are equally as pretty. One room had three pianos in it. Obviously music was must have been an important part of their lives as in addition to the pianos I saw a harp and a guitar. Significant for its Greek revival style it is truly an Antebellum home. During the Civil War Natchez was very divided and perhaps that it why so few of the Natchez homes were destroyed. In fact, Rosalie served as Union Headquarters with all of their offices downstairs while the two surviving daughters of Stephen and Fanny Rumble lived upstairs during this time. As I heard one interpreter say “a series of unfortunate events” caused financial hard times: war, boll weevil and the Depression. The daughters were victims of these hard times as well so in 1938 they sold the house to the Mississippi DAR although both continued to live there until their deaths. Annie died in 1958 at the age of 101 and was the last descendant to live there. By this time we were starving and as we were walking out another guide suggested we go right across the street to Fat Mama’s Tamales so off we went. Since I’m not too fond of that type of food I wasn’t very excited but I was hungry and it was close! 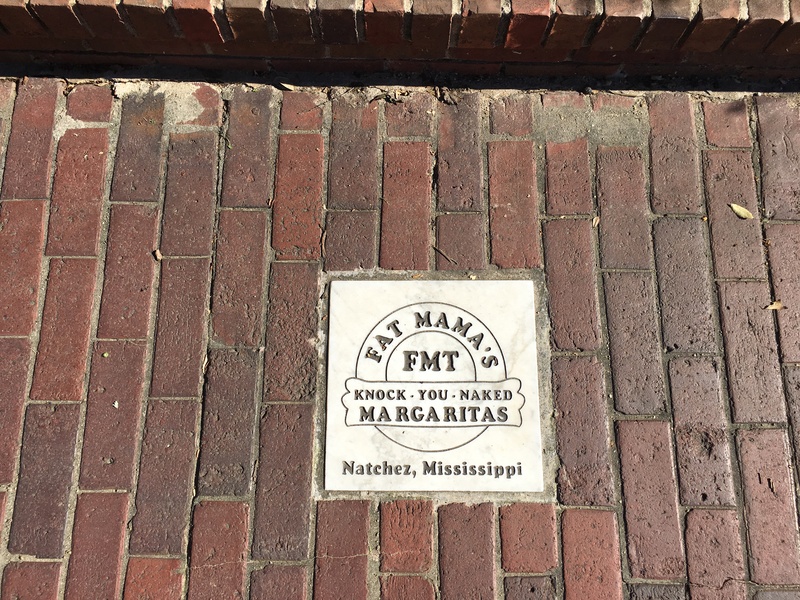 The brick marker on the outside said they served Knock Your Clothes Off Margaritas. I didn’t try one but we did try the Fire and Ice pickles and they were quite tasty. We both got a gringo pie which is three tamales topped with chili, cheese, onions, and jalapenos. Wow, they were hot and very good! We had been told about a Mardi Gras parade beginning at 5:00 so we decided to wait around for that. Since we had three hours to kill we started walking. I had earlier said that I wanted to take a horse and carriage tour and we walked right by them but I thought it was a little too cold for the ride since we didn’t have our heavy coats. We continued our walk and ended up at the William Johnson House. This is a part of history that few people know about. 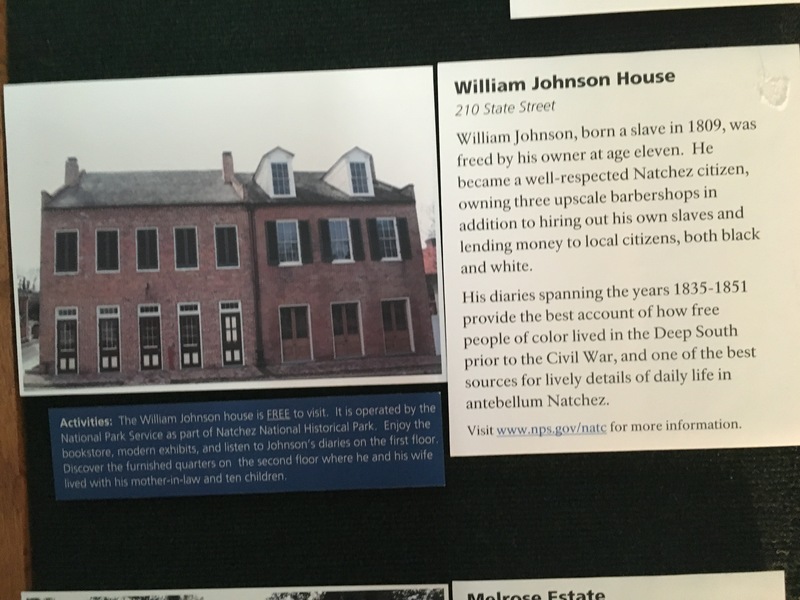 William Johnson was a freed slave who owned his own barber shop (The Barber of Natchez) along with numerous buildings and a lot of land in and around Natchez. He rented out the bottom of his house to various businesses and he and his family lived upstairs. A prosperous business man he also own slaves as well. Much of his life adult life is well known because he kept meticulous diaries. While there are only a few entries about his marriage he apparently had a good marriage and was a devoted husband and father to his eleven children. His life story is fascinating as he was apparently the son of a white slave owner and a black slave. Both his mother and his sister to whom he was devoted had earlier been emancipated but William was too young at the time. He was emancipated when he was eleven. After our visit there we walked to downtown Natchez. It is not a large city and I was surprised at how quiet it was. Though there were many parked cars we saw very few people. We finally sat on a bench in the sun and decided to sit there for a while and wait for the parade. Jerry read and I people watched! Fascinating to say the least! After a while we moved down closer to where the parade was going to begin. This parade was very different from the parade we saw in Slidell. There were no dance studios or cheering camps represented so no children. There were only two bands and the rest of the parade was floats from different krewes. Beads, beads, and more beads. I have no idea what we will do with them but suffice it to say we have a lot! I did get a nice coozie and we got a couple of pieces of candy. After the parade we walked back to the Visitors Center and then headed to Walmart. The heater that we use in the bathroom in the mornings died today so we decided that since we weren’t going south but north now we’d better get another one thus our trip to Walmart. That accomplished we headed to the coach. We had taken a meatloaf out of the freezer in preparation for dinner tonight but decided that it was just too late to cook. Jerry had Brunswick stew and I didn’t eat. It was a good day but a full day and more to follow tomorrow!